As I’ve mentioned several times in previous posts, I’m quite busy with work and work-related stuff at the moment, so progress on my MOTHER 1+2 project has been very slow. It’s going to stay this way for a few months more at least, but I thought I’d give a quick status report and a small patch for testing. Right now there isn’t a whole lot of hard work left on the patch, mainly lots of little things all over the place. I also need to put together a menu patch for the MOTHER 2 portion. Right now I’m working on things like the game select screen, the intro screen, and the naming screens. I was also playtesting the translation for context issues and to document bugs, I got to Duncan’s Factory and then died, and for some reason I always stop playing the game at that point. But that’s where I am now. Anyway, one thing that I sorely need is an archive of save files from throughout the game. If anyone knows of any MOTHER 1+2 save file archives out there, please let me know. If there aren’t any, it’d help me a lot if someone could play through the game and make many save files at various parts of the game. Normal save files, though, not save states. Also, since I don’t have much time to test it out myself, I was hoping some folks here might be willing to try out the Easy Ring item and see how the gameplay balance is. So I whipped up a patch that has just the Easy Ring stuff in it. Apply the patch and then check the leftmost box in the basement. It’ll have “ITEM55” in it. Equip it and then play through the game. Actually, now that I think about it, a big archive of save files (not save states!) would be very helpful to have for BOTH games in MOTHER 1+2. Anybody willing to put some together? Glad to hear you’re still plugging away in your spare time. Do you want the Mother 1 save files to have used your Easy Ring or not? Hmmm…I will test it out in my spare time, and tell you what I find out…I may need a guide for this. .0_0. Oh, it doesn’t matter if the save uses the ring or not. The save file formats aren’t altered in any way so save files will work with or without the patch on. I have spare time later tonight and tomorrow. I can playthrough a ton of the game so I’ll just see what happens. How does one export save files, exactly? I haven’t playing NES games on my computer in years – only on the DS – and I don’t really know if I’m an idiot, or if I need to do something special for save files vs. save states. Just curious to help. I’ve got a save file at Mt. Itoi, final boss. But Ninten and co’s name isn’t the original, I named it something different to my liking. Do the existing M1 English Patches work with this? Anne Noise: If you don’t change any settings, by default Visual Boy Advance will put the save file in the same directory as the ROM that you are running. Look for a .sav file. Every time you save in game, the .sav file is modified. (the .sav file is essentially the data normally stored on the battery-backed RAM or flash chip found in the cartridge) Please note that the .sgm files are the save states, created by the emulator when you do a save state, and they are NOT the files wanted here. Anne Noise: Well, this isn’t for the NES version, but for most emulators when you save a file normally it will create an actual file somewhere, for SNES ROMs it’s usually a .srm file, for GBA and other systems it’s often a .sav file. Blue: I don’t know, but most likely. It’s a very small patch. Tried out a bit of it today. I progressed farther with this patch. So far not bad. Only took me a few minutes (ok maybe not that short, but it would have took forever without a patch, so I assume like 30 minutes or less) to get me to Magicant. I’m thinking to add this to my flashcart so I can test it where ever I go. So far nothing glitchy has happened. Ah, the Easy Ring, right, i almost forgot about that thing but i guess it’ll make things better for multiple playthroughs and in bug testing. The good news for me really, is that THE Mato is still going up for challenges in hacking a menu patch for the Mother2 side in the next few months. I’d love to play Mother again of course, with proper non-dry text (is that proper terminology or should i say wet?) and i get to say NO to censorship. By the by, I would LOVE to create save file archives on the Mother2 side for you Mato, anything i can do to help. Just let me know how often in the game/ what points in the game you need them, and i’ll start right away. MarioFan3: Just any major part of the game. Maybe check out the Starmen.Net EB walkthrough and for each section make a save or two. Finding saves for M1+2 has always been really hard, so this will be really useful! Of course, it’s something I’ve always wanted to make myself so other people can use it too. I just never had the time. Hey man it’s a good thing I think you’re taking your time. No point in stressing yourself, and I’m sure no one is in a huge hurry to play Mother 1+2. 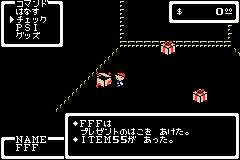 After all we have Mother 1 and 2 translated already for us, if anything I’ll try to test out your ring when I have time. Take it easy :P.
Most, likely, although I’ve had some problems with converting saves on patched games to the original already, so they work like 20% of the time, i think it’s on my end though so try it anyway. Mato: Regarding Mother 1, do you want saves for like when we go to different towns for the first time, when we get a new team member, when we go to a *insert specific location here* for the first time, and when we get a new melody? So, I used the patch and I had a question concerning the reduction in random battles. As best I can tell, this patch does reduce the number of encounters overall, but there are times when you will walk a single step and get a battle immediately. Is there a way to modify the way the patch changes the encounter rate such that a minimum number of steps is guaranteed? That would improve things from my perspective, if possible to cleanly implement. I haven’t hacked the game, but I would guess the game makes use of a simple PRNG to generate a random integer after each battle. Then, after returning from a fight, your steps counter is increased until it matches that value, at which point you get your next battle (counter resets, etc.). Does your patch simply double that next-encounter value in order to get more steps before the next random battle? Sadly, it’s not that simple. It’s several layers of stuff working together, but what the patch does is basically reduce the odds per tile type. I don’t think there’s a minimum step thing in the game (otherwise the problem wouldn’t even exist as it does now) and I don’t think it’d be very easy to hack in. If it happens too often I could slightly reduce the odds further but I think there’ll always be that chance of getting another battle right away just out of sheer bad luck. I’m hoping that people will be able to tell me if the battles are reduced too much or too little, that way I can tweak it. The current reduction level is pretty arbitrary. Interesting. Oh well, it doesn’t seem to happen all that often, I was just hoping there was an easy way of adding a constant value in (say 5) to guarantee at least that many steps before a battle. I’ll play a little more to be sure, but the current reduction is already much appreciated and certainly doesn’t appear to be overkill. I really enjoyed zooming through the first part of the game and not having to grind. Well, I’m basically through with my play of Mother 1. I hope it’s okay to post my impressions here. I found that it gives a pretty good balance to the difficulty of the game, especially once you consider this wasn’t my first playthrough and yet I still had a game over once or twice. Obviously the beginning of the game is expedited by the easy ring tremendously. The deadly PK attacks of later enemies make up for it, of course, and, if you play without purposely inflating your levels, you’ll find yourself warping to safety at certain difficult points as usual. The enemies that guard the last part of the game are still really tough (one of my game overs happened here), but that really goes without saying. I suppose you could remove the defense boost that the easy ring gives, which the first part of the game way too easy, but then the main character will have to choose between upgrading to the Gold Ring for defense or sticking with the great experience, gold, and reduced battles. For anyone that has played the game at least once, it seems to leave just enough challenge to keep things interesting while eliminating the need to grind. Cool, cool. I’m not sure what to do about the fact that the ring has low defense if you keep it on (mainly a problem later in the game it sounds like), it would be tough to hack in any other way of enabling the easy mode. I think the ring has to have at least 1 Def. point for the item to work properly too, so that’s why it seems a little easier in the beginning. What about Duncan’s Factory? Was it a chore/did you get attacked a lot? I think that’s where a lot of people give up so I’m curious about how well it works there especially. Mt. Itoi sounds crazy though. You could provide multiple Easy Rings throughout the game, each with a progressively higher amount of defense. That way, players would be able to keep the Easy Ring effects while not sacrificing the defense of the more powerful rings. Of course, you’d need to make sure the ring’s other bonuses — XP, money, and encounter rate — didn’t duplicate if more than one character had different ranks of the ring on. I don’t really know how feasible that is given what you have access to. Actually, I don’t think there’s a better ring to equip for defense than the Gold Ring, and I bought that on my first visit to Magicant. I noticed that there was no defense difference when I toggled it with the easy ring, thus how I came to believe the easy ring ups your defense by 50 points (and makes all early enemies hit for such little damage, before you normally have any equipment to boost defense). Duncan’s Factory was sort of a chore, I guess. No where near as bad with fewer encounters. Had I remembered to bring bread crumbs, I would have saved myself half the trip. That’s really the first area that starts to seem tough, thanks to the fire ball enemy and his PK fire. I got carried away with playing and only made two archive saves. One right after getting Ana in my party, the other being my save right before the final trek to Itoi’s top cave. Oh, and going off of what Darien was saying, I thought a cool idea would be to start the easy ring with a small defense increase. Then, when you get to Magicant, you could offer the ring to the fountain and it would get upgraded to the defense value it currently gives, like how the weeds turn into herbs. I think Ducan’s Factory is going to be a pain no matter what you do to the game. Even if the encounters were fair and the battles were easy, you’re still going to wonder around aimlessly with no real clue which way you’re supposed to go (assuming its your first playthrough, of course). Its really more of a level design issue that makes it such a chore, though I’m sure the reduced encounter rate would at least make it less tedious. I’m about half way done with my save archive(so far I have 7 saves created). I’ll probably be done in 3 days. I’ve finished my Mother2 save archive, 46 in total. Only problem is, I can’t send in zip files. You can’t send .zip files? People send them to me all the time. You could always e-mail the .zip to me at tomato@starmen.net if the contact form doesn’t work, or you could put them online somewhere we we can dload them all. Whew thanks, it has been e-mailed to you now. Okay, my Save Archive is complete! 17 saves were made. I’m new to this sort of thing so I only just figured out how to upload stuff. Ok, my old link for my save archive is messed up, so I re-uploaded the MOTHER 1 archive to MediaFire instead. Okay…so I’m at Mt. Itoi, and it seems like it’s a lot easier, even when fighting the tougher enemies. As for grinding, the fastest way is to train at Snowman. I’ve played EB0, EB0 Easy, and now this with the Easy Ring, and I’ve got to say that this version is much more enjoyable. I have to say that this port is pretty darn good. First off, I love all the work you’ve done so far. Although I haven’t finished it yet, I have loved every minute of Mother 3 so far. I probably would not have played it if not for the translation patch. That is why I’m so eager to see the Mother 1+2 patch come into existence. I would love to be able to just take the entire series with me anywhere, and not have to dust off the old consoles in hope that I can get them to run. So, I guess all I’m looking for is a status update. It’s been like 2 months, so I know it’ll be nowhere near finished, but it’s nice to hear how things are progressing. Hey, Translator guy. Don’t give up on finishing it! I’m depending on playing and getting through that game so I can do the same for Mother 2/Earthbound and Mother 3! So keep at it. I won’t be disappointed. how do you apply the patch to the game? these are to replace the mother 1 an mother 2 logos at the opening of mother 1+2! also, this is for you tomato! and i love mother and i hate reggie! 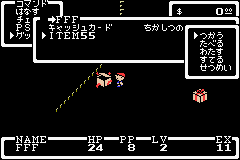 also, JEFFMAN, please help him for mother 2’s translation! Did I just see someone ACTUALLY link to their C Drive…? I must be dreaming… BOING! Uhm, not to be rude or anything but you do know we can’t see the stuff that’s on your hard drive, right? I suggest you upload to an external host(Megaupload would be your best bet.) I’m not making fun of you, we all make these kinds of mistakes sometimes. Try uploading the files on megaupload.com, then they’ll give you a link which you can post here. That’ll enable us to see the files, m’kay? the other is the logo! PS this is for MATO AND JEFFMAN! Just a little encouragement here! It’s sad Nintendo doesn’t believe as much in these games as you do. Keep it up and keep us updated! So are you going to restore the censored sprites too? I still can’t wait for the full retranslation patch to be finished. The lack of updates is truly disheartening…. Despite completing EarthBound Zero, it still feels like the only Mother game I’ve never finished. It’s the only one not “properly” translated, so many things left out. I’d love to play a true, honest-to-God translation. Please hurry! It’s always good to hope right? Anticipation is eating me alive! @Corey: Hey… aren’t you the awesome guy from the blue disk saga (earthbound 64)?? No, different Corey. This is the first I’ve heard of it, actually. Wow, it’s been months since i last seen earthbound central, but i already finished earthbound/MOTHER 2 for GBA! I am currently on Earthbound Zero/MOTHER 1! A few months ago, i tested the easy ring, i tell you, tomato, that was the best idea I’ve seen so far in my life! Keep Up the good work! Tomato, how is the translation going? If you can Mato, make an update. it’s been seven months now and i haven’t heard if you finished the MOTHER 1 translation, or if jeffman is currnetly doing MOTHER 2.
if you can, make that update! At least we got a Mother 3 translation, so it’s not all bad. Any updates on the EB0 translation? I was nostalgia tripping today watching the final boss battle that I could never beat, wanting to play it again, but couldn’t help noticing how bad the fixed width font looks! I think we can all live with a fixed-width font. Can we just get a working translation? I doubt I’m the only one who would be only too happy to throw in some cash as incentive – goodness knows you deserve it. Oh, well it’s mostly the broken half-english which makes it look so ugly. If you ever pick up the Mother 1 project again i hope you don’t let the font thing be a dealbreaker. Just fyi, your translation of mother 3 might be the best game I’ve ever played. Heartwarming, hilarious, quirky, charming, heart-grabbing.. truly masterful work. Just about to start another play-through :). All earthbound fans are forever indebted to you Mato! Wow, I didn’t realize that you already have a very nice looking translation of Mother 1 completed. (!!!!!!!) Yes! The youtube videos I was watching were definitely using some much older hack..
That’ll teach me for posting without reading news posts. Now to find a good NES emulator. Never mind.. delete my post before people get excited. From now on I’ll read everything before posting.. sorry. Really hope you finish this some time, it would be amazing since I’ve already seen your translation skills with Mother 3. That was beautiful work man. Just don’t let someone else frustgrate you. 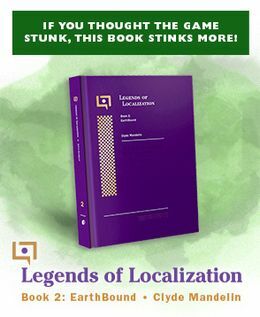 The font ist fine and a lot of Earthbound fans are really excited about this project. Please don’t drop it down! I really hope you start working on this project some more, I’d love to finally play through Mother 1. Mother 3 was amazing, you guys did an awesome job on that!